The hottest part of the year in Las Vegas is finally winding down. Who’s thankful?! Our friends who come to visit from elsewhere in the U.S. describe Vegas in the summer like opening an oven door in your face. And while we are probably used to it by now, it’s certain most of us are also relieved when the intense summer heat starts to wane. We’ve talked a lot about how heat is a very good breeding ground for mold growth. Fortunately, Nevada’s climate is mostly dry, but that doesn’t mean mold can’t grow under the right conditions. Often, mold growth is triggered by factors within our home environment that we may not see … rather than external weather conditions. When it does, be sure to contact a professional mold removal specialist who can identify the source of your mold problem and eradicate it. Here are four things to look for that could trigger mold growth, and what to do about it. Check your A/C size. Air conditioning units that are too small are energy wasters because they run constantly. While not necessarily a problem for mold if it’s a whole-home unit, having a window unit that runs around the clock and releases moisture constantly from the unit could be a whole different story. Make sure there is no standing water. Is there anywhere in the home that experiences chronic dampness or where there is continually standing water? Check specifically around air conditioning units, hot water tanks, showers, toilets, refrigerators, sump pumps, basements, crawl spaces, windows, and so on for any evidence of unwelcome moisture. If you find some, be sure to address it yourself or have a professional come and address the issue sooner than later. 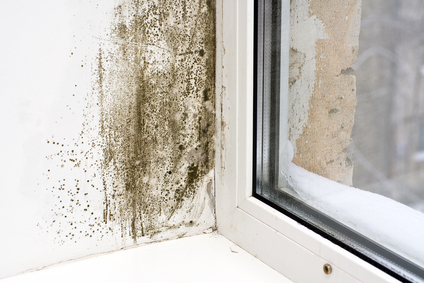 Where water is present and under the right conditions, many environmental experts believe mold can start growing in as little as a 48 hours; sometimes even less. Install a dehumidifier. Now that you’ve checked for any areas of moisture and had any issues fixed, installing a good dehumidifier can help ensure that moisture doesn’t return. There are different types of dehumidifiers, and they come at many different price points. You can purchase smaller units that shut off when the tank is full and you have to manually empty, or you can purchase a unit that attaches to your furnace and works for the entire house. Those units generally have a hose that can empty into a floor drain, so you never need to worry about emptying a tank yourself. The more humid the climate, the more likely a whole-house system is what you need. Eliminate Clutter. We aren’t necessarily talking about knickknacks on a bookshelf here. We mean clutter that is blocking air vents, windows, and so on. Furniture and window treatments sitting on or blocking air vents could become damp and foster mold growth, plus they prevent air from circulating effectively in the home. All of this working together creates an ideal breeding ground for mold, and once mold grows on one surface, the spores can become airborne and find other places to grow. These tips are good for homes and businesses in our desert climate. If you are ever concerned you might have mold growth, or have unwanted moisture present somewhere, a quick call to ERX Emergency Restoration can get you on the road to kicking mold, mold spores, mold damage, and … well … anything else mold and water-damage related to the curb!